1 Federal Census, KS, Atchison County, 1910, Atchison Ward 2, E.D. 3, Sheet 14A, Image 27 of 41, Ancestry.com (Online Census Images). 2 Federal Census, KS, Atchison County, 1900, Atchison Ward 2, E.D. 3, Sheet 10B, Image 20 of 28, Ancestry.com (Online Census Images). 3 Federal Census, KS, Atchison County, 1880, Atchison, E.D. 2, p. 9, Image 9 of 71, Ancestry.com (Online Census Images). 4 Federal Census, MI, Barry County, 1850, Prairieville, Image 5 of 14, Ancestry.com (Online Census Images). 5 Federal Census, KS, Atchison, 1870, Atchison Ward 2, p. 8, Image 8 of 38, Ancestry.com (Online Census Images). 6 Find A Grave, (accessed 07/30/2015). 7 Genealogical and Biographical Record of North-Eastern Kansas, Chicago: The Lewis Publishing Company (1900), 27-42, Google Books (Digital Library). 8 Pennsylvania and New Jersey, Church and Town Records, 1669-2013, Marriage record for Alfred G Otis and Amelia Harres, Ancestry.com (Online Database). 9 The Indiana Gazette (Indiana, Pennsylvania), 30 OCT 1962, p. 1, Obituary for Amy Otis Earhart, Newspapers.com (Digital Library), www.newspapers.com. 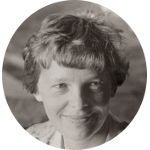 10 Amelia Earhart Birthplace Museum, "Home as a Birthplace", (accessed 07/30/2015). 11 Otis, William A., A Genealogical and Historical Memoir of the Otis Family in America, Chicago: Unknown (1924), 427, Ancestry.com (Online Database). 12 Roberts, Gary Boyd, "#58 Royal Descents, Notable Kin, and Printed Sources: Elizabeth Boyd Roberts: A Genealogical Tribute with 50 New . . .", (accessed 07/06/2017). 13 Wikipedia, "Amelia Earhart", (accessed 07/30/2015).